It's that time of year when an extra dose of Vitamin C is needed. Flu epidemics, coughing, sneezing people on crowded subways, and bleak weather are just some of the facts of life during February in New York City. That, and the beautiful yellow-green undertone in my face. I need sunny things, bright colors, and bracing flavors but not another roasted root vegetable. This is why I crave citrus at this time of year. Citrus in the form of food. A glass of OJ doesn't cut it. I want citrus salads, citrus desserts and most recently citrus-flavored cocktails. When I was a kid, one of my Floridian great-aunts used to send up a package of pink grapefruits every winter. I didn't appreciate it at the time, thinking then that grapefruits were too sour to be edible, but the thought of a package of grapefruit arriving at my door now seems like the best mail you could find, unless of course that package also included a plane ticket to somewhere warm. To hold me over another month or two, cooking food that evokes warm weather (tacos anyone?) and eating bold flavors (acidic, spicy, pickled to name a few) is the only thing I can do to keep my taste buds from sinking into hibernation for good. 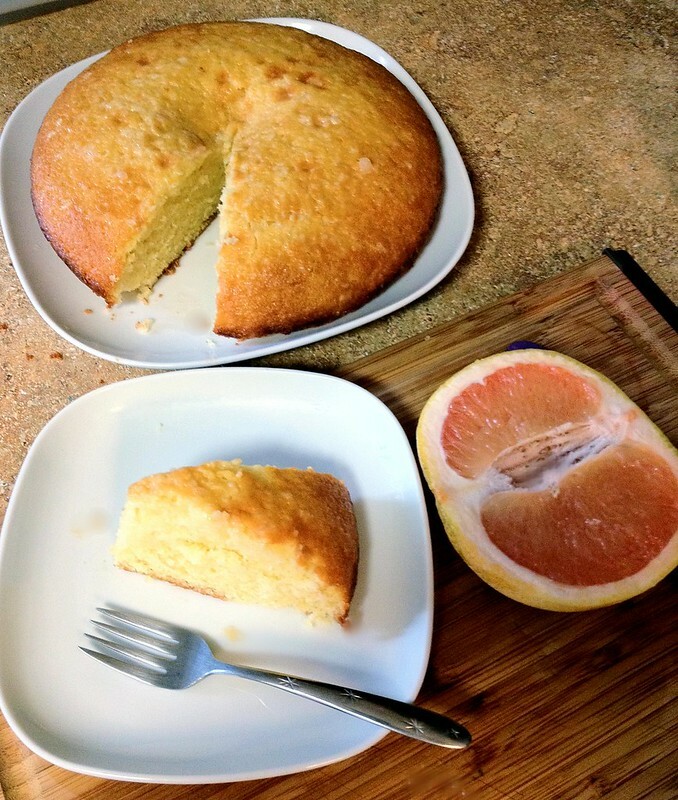 One easy baked good that I make fairly regularly when my Grandma comes for lunch is a simple yogurt cake (aka Gâteau au yaourt that I found on Foodbeam's original blog ages ago) but doused with pink grapefruit juice and flecked with grapefruit zest. You can use any citrus you like, but pink grapefruit is unexpected, and sweet, and tart at the same time. It also smells divine. Before you serve it, pinch your cheeks for an added glow of health. Grandma-ma will approve, even if she tells you, you need a haircut. Preheat oven to 350 degrees Fahrenheit. Prep an 8-9 inch pan with parchment (can use a bundt pan but cake won't be that high). Mix yogurt through sugar in a bowl. Mix in oil, eggs and zest until thoroughly incorporated. Pour mixture into prepared pan. Bake cake for 30-35 minutes or until a toothpick comes out clean. Flip the cake out of the pan onto a platter and drench with reserved grapefruit juice. (The cake will be very moist, and continue to soak up juice as it cools).